StellaBella: Breaking the Rules in Bay Ridge! 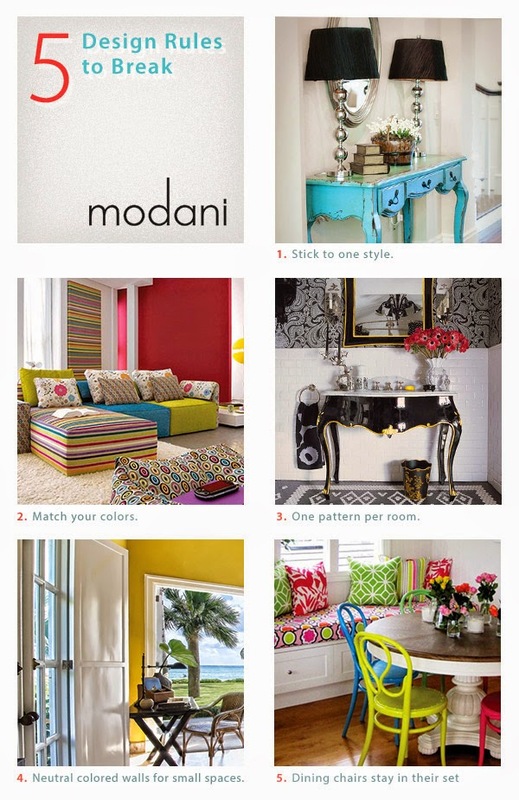 I was so excited to get an email recently from the furniture company Modani modern furniture, asking if I would like to write a post about breaking design rules! I said, "Sure!" Where to start? I mean, the idea of learning what the rules are, is all about knowing how to break them the right way, right? We grow up learning the Golden Rule as children. As we mature, we decide what rules we want to live by, and that's the choice we get to make as adults. In the same way, we decide what our home looks like. If our style is a reflection of who we are, then how much of a rebellious anarchist we are, should also be reflected! 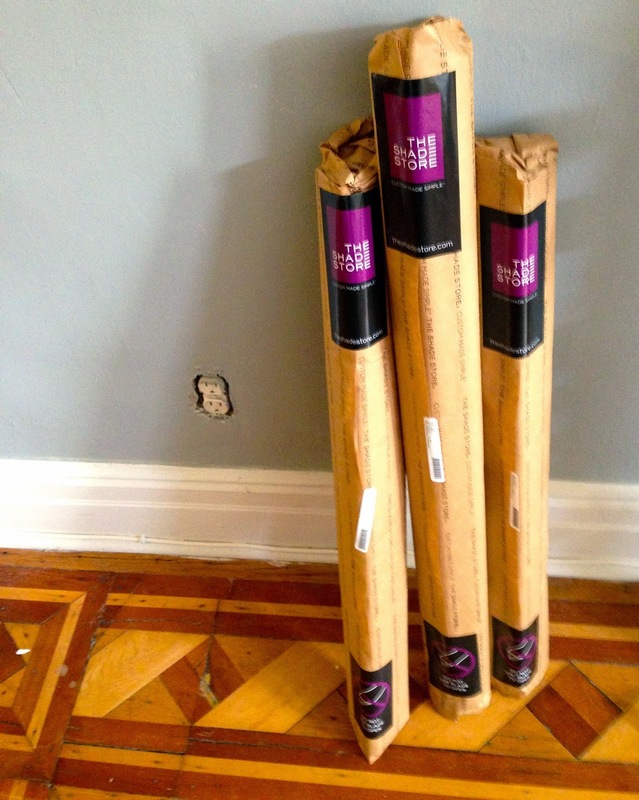 We can look at those different decorating rules, but we always need to walk to the beat of our own drum. While I'm still working on a few other posts on our new home in Bay Ridge, I thought it was an opportunity to show off the front of our home. 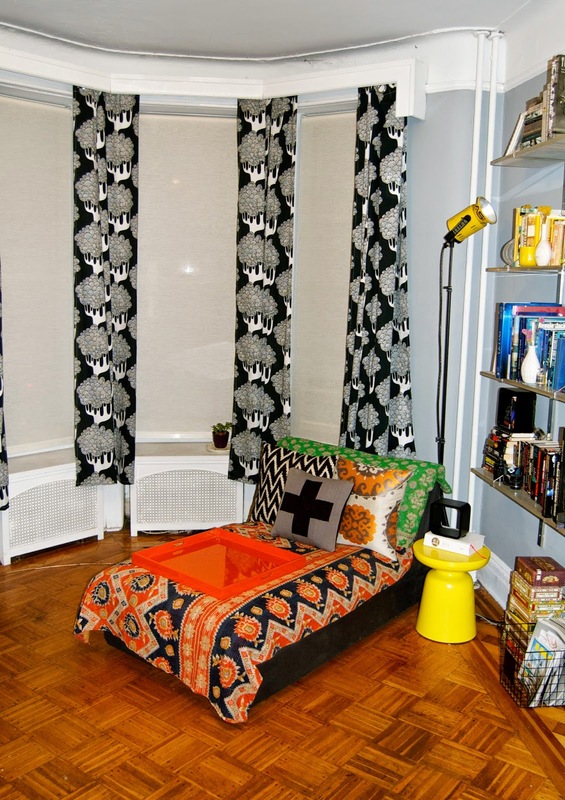 This is my favorite place to sit and relax - our "Bay Ridge bay window", and how I decided to dress it! Before I talk about my own style, I want to discuss Modani modern furniture. With store locations all over the US & Canada, and more on the way; if you are looking for clean modern lines do not look any further. I recommend checking them out online or in person. This is the high quality modern furniture that sets the tone for an entire room! I love our bay window, but we also have another in the back of the house, in the bedroom. The apartment is on the first floor, so we needed to cover them all for privacy. This was the priority when we first moved in, but I also knew we had to do it right. We had such a great experience with The Shade Store in the past, that we spent the extra $ on getting them professionally fitted again! When I was choosing between swatches for each room, I also checked out their drapery to price out their cheaper fabric. Nevermind! Not right away at least, I needed to find another alternative if I wanted to dress these windows further, after getting the neutral shades installed. For now, (which is my favorite part of design - always in motion), we found these CHEAP curtains from Ikea, to solve the problem. I first found 2 panels for $19.99, then I went back again and bought more marked down to $14.99! This was a great solution after spending so much on the shades. I love this playful b&w pattern, and it definitely has been a conversation piece with our guests. But, I would never just stop there! Mixing patterns is a really fun activity I enjoy with my home and fashion. But it can walk a fine line. There needs to be elements breaking up the opposing patterns. Above, the plus sign pillow, lemon martini side table, neutral shades, and orange lacquer tray are all examples of this. 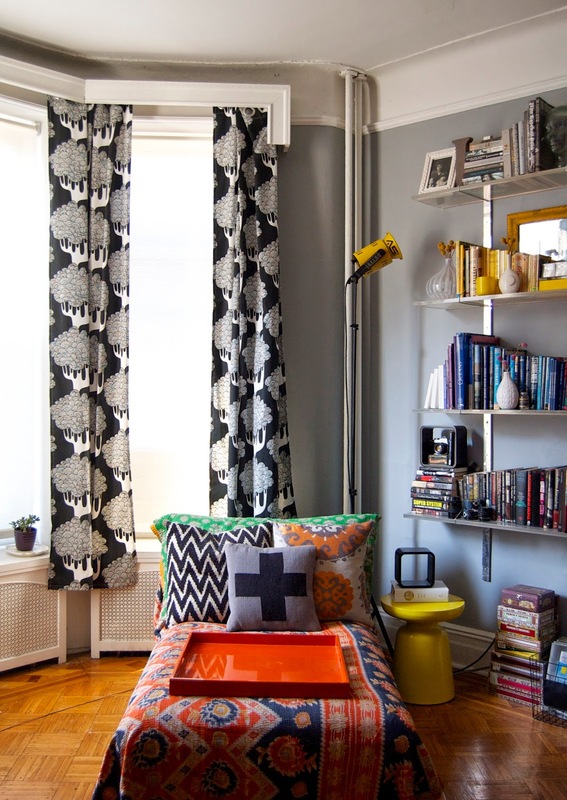 Another tip is to keep a common color scheme; so even when the patterns clash, there is still cohesiveness. Stripes work well mixed with more elaborate designs, and it's always fun to throw in a floral or polka dot. Using pillows and throws is ever changing, you can continue to switch things up! But I think when it comes down to it, you just have to put the patterns next to each other & go with your gut. Don't be safe, stand a little outside of the box, and try something you wouldn't think would work. You will know if 2 different patterns work or not. You'll know, because it's your choice! 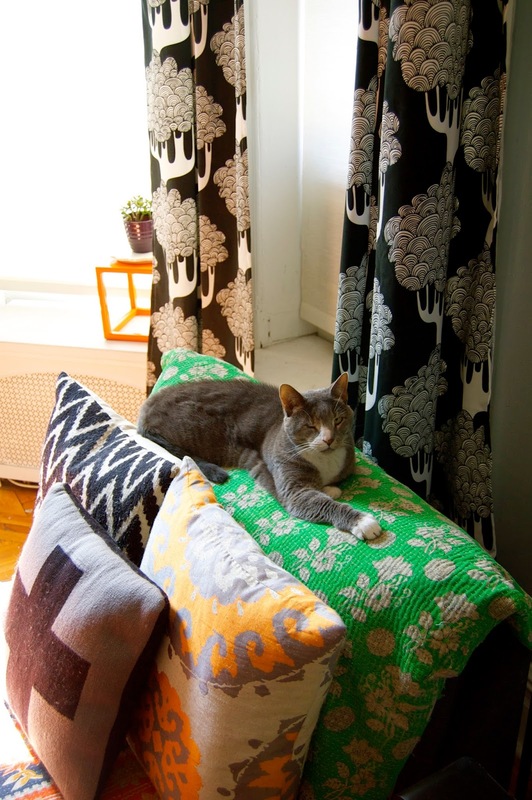 At the end of the day, NO room - whether it be a "one pattern per room", or many, is ever complete without your loving pet! Here is my one-eyed cat. My model, Lefty.